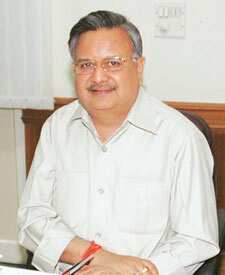 Jagdalpur, Bastar: Villagers in this part of Chhattisgarh call chief minister Raman Singh “Chawal wale baba", or the one who provides rice. Singh, whose pictures across towns eclipse those of national leaders of his party, is hoping to cash in on welfare measures initiated in the past five years, such as providing inexpensive rice, to return to power in a young state—it was carved out of Madhya Pradesh in 2000—that goes to polls on 14 November and 20 November to elect its second government. While some political analysts, locals and government officials here say Singh’s sops—such as providing rice at Rs3 a kg and salt at 12.5 paise a kg for so-called below poverty line families—will help pull in votes, others say the BJP may be hamstrung by widespread corruption charges. According to a government official who didn’t want to be named, about 3.6 million families and almost 50% of the state’s 20 million population benefit from these programmes. “We have two meals a day because of him (Singh)," said Hemant Sahu, a carpenter in Kurud town in Dhamtari district. “The government is also providing kerosene at Rs9.50 per litre at the haats (local weekly markets)." With his rice scheme, Singh has initiated a new strategy for central Indian politics, said Biraj Patnaik, principal adviser to the Office of the Commissioners of the Supreme Court, who has worked on the food security scheme in the state. “It (food scheme) has the potential to change the political contours (in Chhattisgarh)." Interestingly, Singh has not raised any of the BJP’s favourite national-level issues in the state. “The ruling MLAs (members of the legislative assembly) are notorious for their corruption and arrogance. The party has replaced 18 sitting MLAs, but no minister has been denied a ticket (to contest elections)," Kumar added. Sensing the popularity of Singh’s schemes, the Congress party has announced that it will provide rice at Rs2 a kg if it is voted to power. The party, whose campaign is led by former chief minister Ajit Jogi, has pinned its hopes on the anti-incumbency wave and popular sentiment against corruption. But there is a perception among many party workers that the party leadership is not doing enough. According to a local Congress leader who spoke on condition of anonymity, the Congress party has not been working “seriously" to give the BJP a tough fight in the state. “The people want to vote for the Congress. But the leaders here have not done any homework," he said. Kumar also expects the Bahujan Samaj Party, or BSP, which has fielded candidates in all 90 seats in the state, to eat into Congress votes, especially among the Dalits (lower castes) with Uttar Pradesh chief minister and BSP chief Mayawati campaigning extensively in the state. Many of the 39 constituencies that are going to polls in the first phase on November 14—polling in the other 51 constituencies will take place on November 20—are plagued by Naxalite violence. A state poll official, who did not want to be named, said that this year, violence has risen in 12 constituencies in the Bastar district that have witnessed 1,100 killings by insurgents since 2004. “This year, the deployment of forces, too, has increased. Hundreds of battalions of paramilitary forces including Border Security Force (BSF), Central Reserve Police Force (CRPF) and armed forces from five states have already been deployed in the region," added a second state government official who did not want to be named. “In villages where the Naxalite attack fears are there, the voting turnout is not expected to be more than 3%," he said. On Sunday, suspected Naxalites killed two local leaders of the BJP in Dantewada district. The incident took place near a forest, some 450km south of Raipur, when the two leaders, Ramesh Singh Rathor and Suryaprakash, were campaigning. “In Narayanpur (believed to be the headquarters of the Naxalites) and Bijapur districts, there are no campaigns...," Pawan Dubey, a local journalist, said. Although the Naxalites have given calls to boycott the elections in many areas in the Bastar region, they have extended silent support to the Communist Party of India, or CPI, candidates, the second government official said. The CPI, which has fielded 21 candidates mainly in the Naxalite-infested districts, has a strong presence in Konda, Dantewada and Chitrakoot assembly constituencies. A senior government official who asked not to be named citing security considerations said the Naxalites have in recent months strengthened their base by securing support of the locals. “They have begun ‘Sangam Sadaya’ (local units) in the villages. The local youth are extending their support to the Naxals." Still, no major party has highlighted the Naxalite issue in its manifesto. “No one is addressing the (Naxalite) issue," Dubey said.